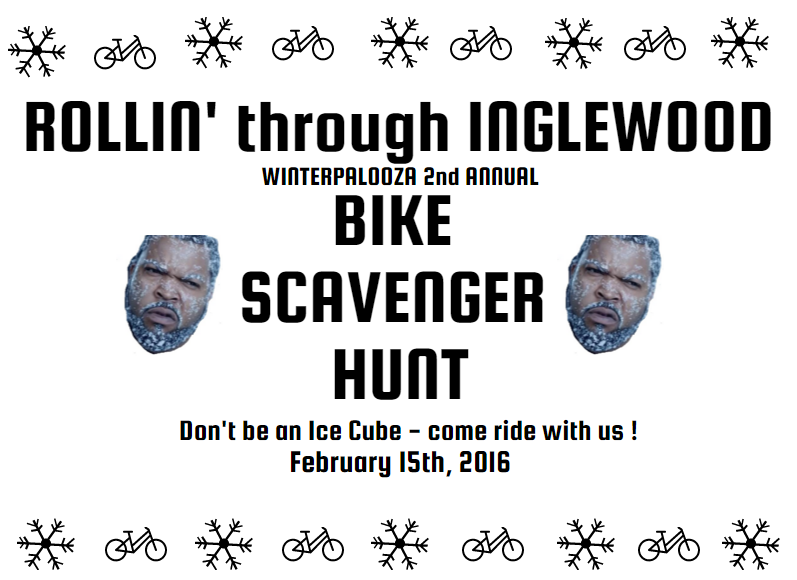 The Winterpalooza 2nd Annual Bike Scavenger Hunt! Don't be an Ice Cube, come ride with us ! Scavenger hunt will take place with clues/questions/photos/dares at locations in and around Inglewood. Prizes & After Party will be hosted at a top secret surprise location in Inglewood. Your last clue will get you there!!! No registration necessary- just show up! Frrreeee and open to all! Hunt will last about an hour (depending on the weather) and end at a top secret surprise location in Inglewood for after-party with prizes and any snacks or drinks you'd like to bring !! !